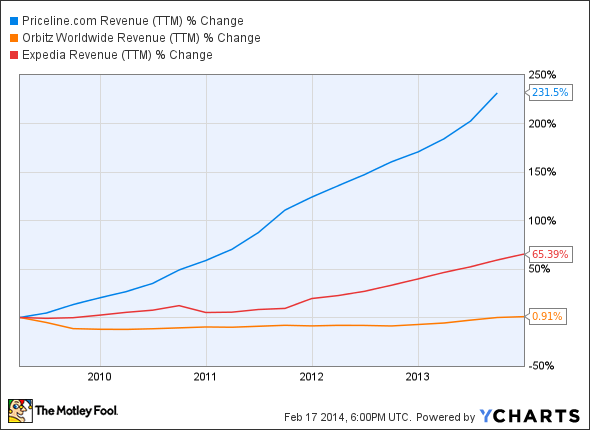 Priceline, Expedia, and Orbitz: Beware or Be Greedy? All three companies have been performing well recently, but one is “high-priced,” another lags its peers in many areas, and the third has already seen its stock fly after its recent earnings release. What’s an investor to do? You might have noticed the recent debate about whether or not Priceline (NASDAQ:BKNG) is overpriced. At the time of this writing Priceline trades at $1,280 per share, which makes it the highest-priced stock in S&P 500 history. On the other hand, Priceline's only trading at 25 times forward earnings. This is still somewhat expensive, but not nearly as expensive as many other stocks out there. As far as the actual stock price goes, keep in mind that it can be adjusted via splits at any time. That said, most people still don't want to buy a stock that trades at over $1,000 per share because they don't perceive it as having much upside potential. That being the case, let's see if Expedia (NASDAQ:EXPE) or Orbitz Worldwide (UNKNOWN:OWW.DL) might present better investment opportunities at this point in time. Expedia and Orbitz recently reported their fourth-quarter results. Orbitz beat expectations as its earnings-per-share came in at $0.05 versus the analyst consensus of $0.00, year-over-year. Revenue came in at $197.4 million versus an expectation of $191.2 million. Gross bookings only increased by 0.2%, but online hotel room bookings climbed by 15%. Looking ahead, Orbitz expects its revenue to grow in the low-to mid-single digits for the current fiscal year and it's excited about its growth prospects in China. Air transactions and price-per-transaction declined by 11% in the fourth quarter, but Orbitz anticipates an improvement in this area. Obritz has seen its stock climb by approximately 25% since this impressive report. Expedia has "only" seen its stock appreciate by approximately 17% since it reported its fourth-quarter results, but don't let stock price fluctuations fool you. If you compare the companies' underlying performances, Expedia was more impressive. For the fourth quarter, Expedia's revenue skyrocketed by 18% year-over-year, its gross bookings shot 21% higher, and its room night growth increased by 25%. Don't overlook Trivago -- a subsidiary of Expedia -- which saw its revenue grow by a whopping 85%, which added four percentage points to the overall revenue growth for the company. Orbitz Worldwide and Expedia both trade at 17 times their forward earnings. Expedia is also the only company of the three mentioned in this article that pays a dividend, as it currently yields 0.80%. That's not a generous yield, but it's still a bonus. As far as Priceline goes, it reports on February 20. This event might have taken place by the time you read this. While it's impossible to predict what will happen, we can take a look at Priceline's long-term prospects in comparison with those of its peers. Contrary to popular belief, the long-term winner in this industry won't be the one that wins with its namesake brand, it will be the one that buys up the most successful properties to gain inorganic growth. This will lead to increased diversification and broader global exposure. Look at Expedia's Trivago as a recent example of this. In order for a company to pull off such successes, it's going to need a lot of capital. With that in mind, consider that Priceline generated $2.24 billion in operating cash flow over the past year, whereas Orbitz and Expedia generated operating cash flows of $153.24 million and $776.84 million, respectively. This is still pretty impressive for Expedia, but Orbitz lags by a wide margin. If you look at the balance sheets, Priceline has $6.58 billion in cash and short-term equivalents versus $2.31 billion in long-term debt. Therefore, it's a fiscally healthy company with a lot of potential for future acquisitions. Orbitz has $117.39 million in cash and short-term equivalents versus $443.25 million in long-term debt, which isn't nearly as impressive. Expedia has $1.35 billion in cash and short-term equivalents versus $1.25 billion in long-term debt. This is healthy, but once again it's not quite as impressive as the balance sheet of Priceline. Orbitz seems to be heading in the right direction, but it still falls short of its peers in almost every area. Priceline is growing the fastest and it has the most potential for inorganic growth thanks to its fiscal strength. Therefore, Priceline should continue to be a long-term winner. If you're reading this prior to Priceline's earnings release, then note that anything could happen. Priceline's stock price has already enjoyed a 13% upswing since Orbitz and Expedia reported, primarily due to high expectations. Therefore, good news is already somewhat priced in.